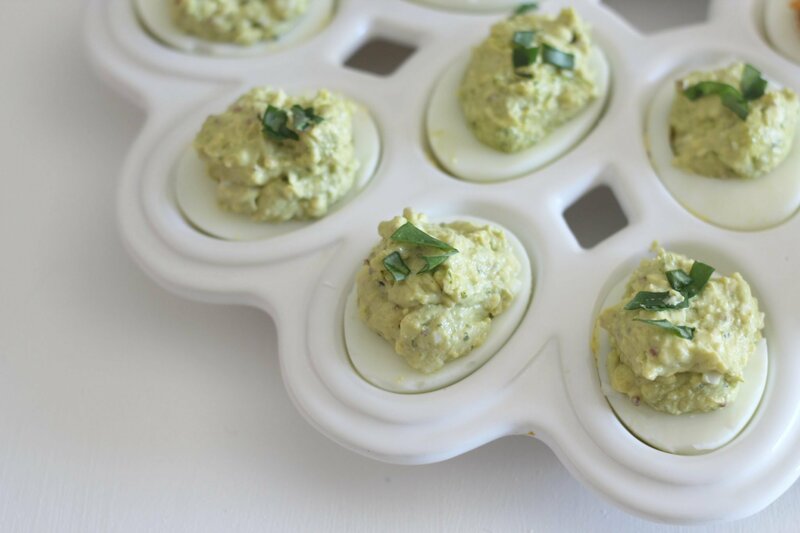 These garlic pesto deviled eggs will make you rethink how you feel about deviled eggs. 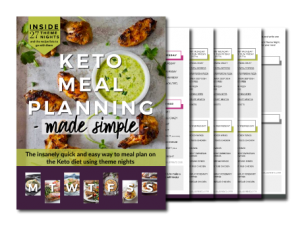 This recipe is flavorful and tasty, and these low carb appetizers are sure to be a hit. 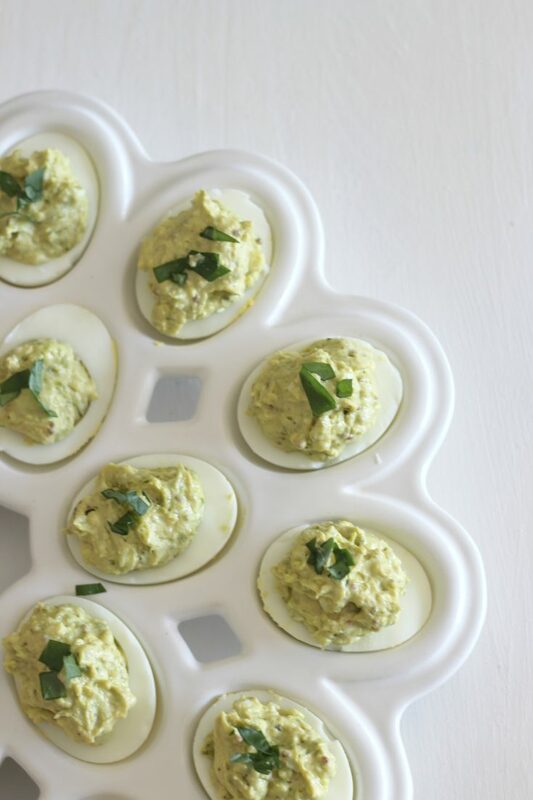 Deviled eggs make me imagine some cosmopolitan party from the 1950s where everyone sips martinis and plays bunco, like some episode of Mad Men. Maybe that’s why I like them so much, it’s some type of creative nostalgia for me. But I seriously love deviled eggs and I really like to get inventive with them. Why not change up the flavor? Add a little prepared pesto and some minced garlic to your traditional recipe and you have something absolutely mouth-watering! 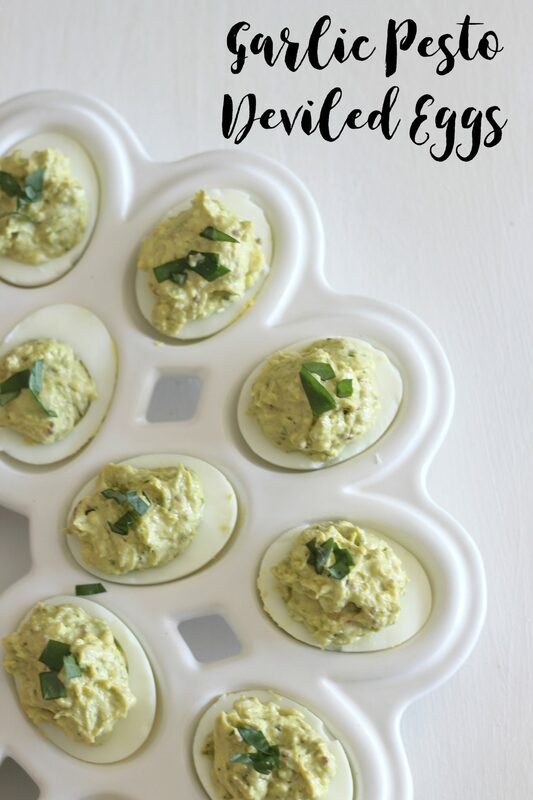 These garlic pesto deviled eggs will become a go-to recipe for your party time appetizer or even just as a mid-afternoon snack to serve the family. Give Me The Recipe Already! 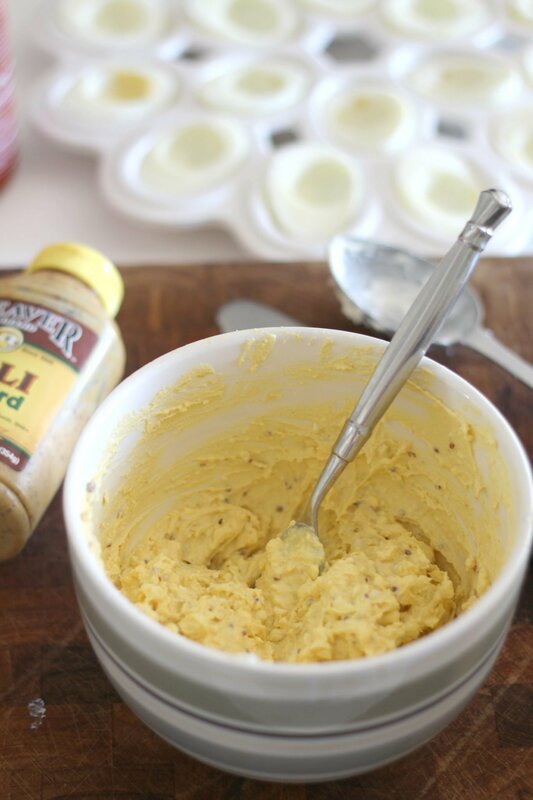 Most deviled egg recipes I see call for dijon mustard. While I love a good dijon, I prefer to use a hearty deli mustard because I love the texture of whole mustard seeds. This one is the mustard I grew up eating from my hometown. The pesto I use is from Costco. So far it is the best prepared pesto I have come across. The only down side is that it comes in such a large container, and I’ve only once been able to use it up before it goes bad. Maybe I should try freezing parts of it? Anyhow, homemade pesto is the best, and if you have the time and supplies to make your own, then go for it! Yum! Simple, perfect hard boiled eggs. The additional garlic isn’t necessary, but it is good. I added one minced garlic clove into the pesto. If the garlic bite gets to you, you can roast the garlic first then add it or just omit the garlic all together, the eggs will still be amazing. Tip: Sometimes, there is an egg that doesn’t peel well. Don’t fret, just chop up the white into small pieces and add it to the yolk mixture. 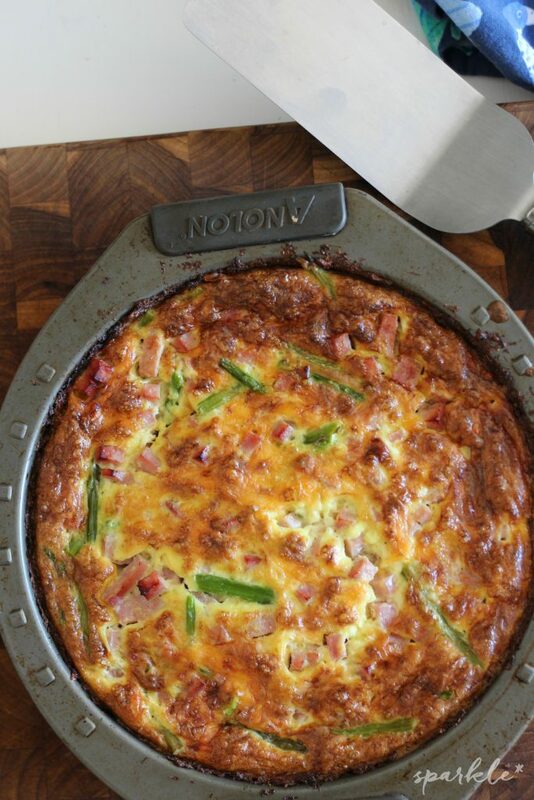 It adds bulk and texture without wasting food. Peel and rinse the the hard boiled eggs. Slice them in half lengthwise and separate the yolks from the whites. Place the white halves on to a plate or a special deviled egg dish. (Mine is from Crate & Barrel.) 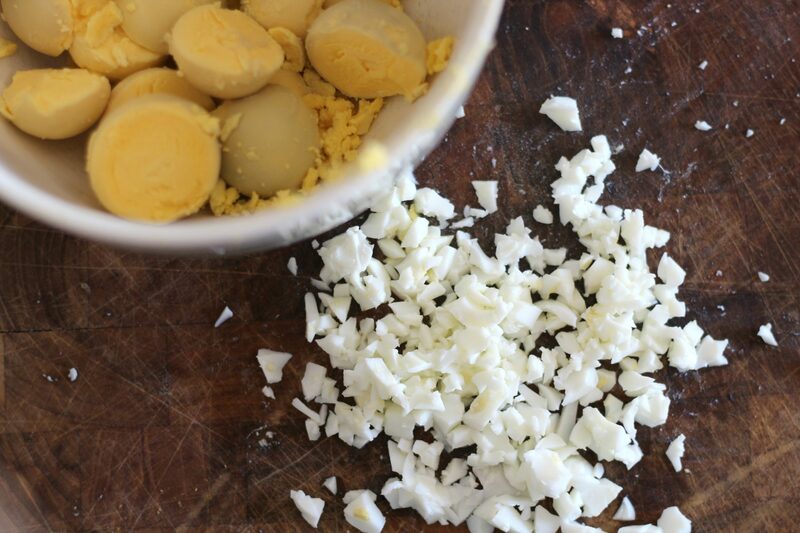 Mix together minced garlic, pesto, mayonnaise, mustard and egg yolk with a fork, to fully incorporate ingredients. Spoon yolk mixture into the holes of the whites. I always fill up the egg, because yummy. Top with a bit of fresh basil leaf. Refrigerate or serve immediately. Peel and rinse the the hard boiled eggs. Slice them in half lengthwise and separate the yolks from the whites. Place the white halves on to a plate or a special deviled egg dish. 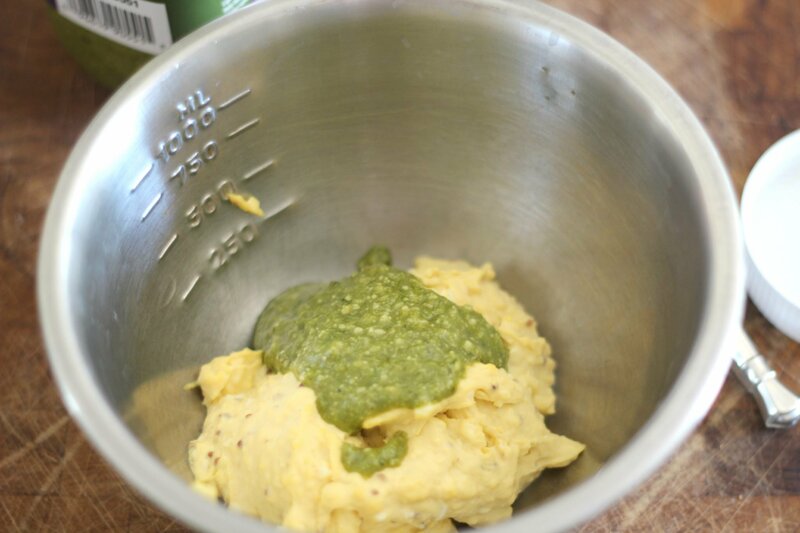 Mix together minced garlic, pesto, mayonnaise, mustard and egg yolk with a fork, to fully incorporate ingredients. Spoon yolk mixture into the holes of the whites.Garnish with a bit of fresh basil leaf. Refrigerate or serve immediately. Will need to make this for our next party!